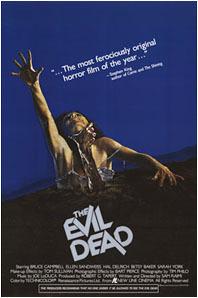 By the mid 1980s, Sam Raimi's The Evil Dead had became a staple of countless video parties. Made on a miniscule budget ($500,000), the movie emerged as one of the most creative and enduring horror films from that period. Raimi hails from Detroit and graduated from Michigan State University. 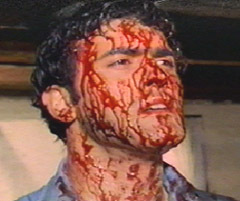 Although he had made several student films, The Evil Dead was his first feature. The lively cast he assembled were all friends...and star Bruce Campbell even helped finance the project. 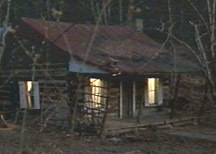 A group of young people are headed for a vacation at an isolated cabin in the woods. Scotty (Hal Delrich) is driving his girlfriend Shelly (Sarah York), another couple, Linda (Betsy Baker) and Ash (Bruce Campbell) - and Ash's sister Cheryl (Ellen Sandweiss). On the way, they narrowly avoid crashing into a truck. The drive has been somewhat perilous and as they get closer to the cabin, they must cross over a rickety bridge. They finally arrive...as the swing on the porch that has been swaying comes to an abrupt halt. During the group's first evening in the cabin, Cheryl sketches a portrait of an old grandfather clock and something odd happens. The clock stops and she loses control of her hand...and ends up drawing an odd shape on her pad. She sees the latch door to the cellar begin to move. At dinner, Ash is proposing a toast and the basement door suddenly swings wide open. Scotty is the only person willing to go down. When he doesn't respond, Ash follows. The two friends find a room filled with items including a rifle, a recorder and a strange book. They take their discoveries upstairs to show the girls. Ash plays the tape that's in the recorder...it's a recording made by the owner of the cabin. The cabin's proprietor describes the pieces in the cellar, explaining that they were found during an archaeological dig. The book is to be used to conjure up undead demons in the surrounding forest. The bit of information gives Cheryl the creeps. When the voice on the recording begins to say the incantation, something in the woods comes alive. Cheryl pleads for the tape to be stopped and a tree branch crashes through the window. The night is winding down. Ash gives Linda a necklace as a gift and the couple settles in front of the fire. As Scotty and Shelly are getting ready for bed, Cheryl hears a voice outside say, "Join us." She decides to investigate and wanders out into the foggy mist of the woods. Bad idea. The vines of a tree come to life and restrain her to the ground...where she is violently raped by the woodlands. Cheryl is released and runs to the cabin as an invisible demon goes after her. She makes it safely inside just in time. Frightened and disheveled, Cheryl demands to be taken into town. Ash agrees to drive her...but they see that the bridge has been destroyed. "It's not gonna let us go!" Cheryl screams. Meanwhile, Ash finishes listening to the tape and discovers that the owner's wife became possessed by a demon. He learns that the only way to kill someone in this state is through dismemberment. As Shelly and Linda play a game of cards, Cheryl looks through a window. Suddenly, she turns around...her eyes rolled back into her head and her skin a sickly color. A demonic voice comes out of her and says, "Why have you disturbed our sleep...awakened us from our ancient slumber? You will die like the others before you...one by one, we will take you!" Cheryl falls to the ground and Linda and Ash go over to her body. Cheryl quietly picks up a pencil and jabs Linda in her ankle, before smacking her across the room. She then knocks Ash and pins him under a bookcase. Scotty hits her with the end of an ax and manages to kick her into the cellar and secure the door with a chain. Linda is put to bed while the others keep an eye on Cheryl. Ash says they'll leave in the morning. Shelly senses something outside of her room. It comes towards her and smashes the window. Shelly screams and Scotty finds her in the bathroom. She too is now possessed and lunges at him, scratching his face. Scotty runs into the living room and is able to shove Shelly into the fireplace. He pulls her out but she attacks him again - with a dagger. Cheryl is gleefully watching from an opening in the the cellar door. Scotty grabs a knife and attempts to cut Shelly's hand. Shelly finishes the job by gnawing her own hand completely off! Scotty picks up the dagger and stabs her in the back, which sends her to the floor spewing blood and other substances. However, she's not dead yet and gets up once again. Scotty picks up the ax and strikes the undead Shelly repeatedly...and then severs all of her limbs. He and Ash take her remains and bury them outside. Scotty makes a hasty exit from the cabin...but Ash refuses to leave Linda behind. When he goes to check up on her, she sits up in the bed and laughs maniacally - with only the whites of her eyes showing. Ash backs up to the doorway and Scotty jumps at him. His good friend didn't make it far and is bloodied and battered. Linda and Cheryl mock them as they try to figure out what to do next. Ash is about to use the rifle on Linda but she seemingly returns to normal. Ash hears Cheryl sound like her old self as well and goes over to the cellar door. It was a trick and his sister grabs at him. Both she and Linda tease him with little girl voices, saying "We're gonna get you...not another peep, time to go to sleep." 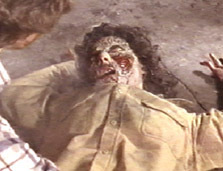 Ash drags Linda outside and returns to Scotty, who is now dead. Linda reappears and stabs Ash with the dagger. During a struggle, Ash manages to stab her with the same dagger and Linda falls backwards onto it. He takes her out to the shed to dismember her with a chainsaw. He can't bring himself to do it and buries her instead. When he's done, he finds the necklace he gave her on the ground and bends down to pick it up. Linda grabs at Ash (again!) and scratches at his legs. She comes out of the grave and Ash repeatedly hits her with a piece of wood. She won't go down easily...so Ash finally wacks her with a shovel and decapitates her. Blood spurts all over him. Ash discovers that Cheryl has escaped from the basement. She tries to reach for him and he fires a shot at her. It has no affect and Ash runs down into the cellar, where it appears as if the entire house is bleeding. Ash loads the rifle and heads back upstairs. The unseen force surrounds him and he starts to flip out. Scotty is now zombified and both he and Cheryl make one last attempt to bring Ash into the fold. While being continuously pummeled by them, Ash gets a hold of the Book of the Dead and tosses it into the fireplace. Cheryl, Scotty, and the book all decompose, with his friends making a final plea to join them. Morning has arrived and Ash is able to breathe some fresh air. But the calm doesn't last long. Behind him and from out of the woods comes a force so sudden and ferocious, Ash can only turn around and scream. 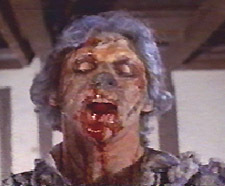 The Evil Dead is a real treat for horror fans. Sam Raimi pulled out all the stops, handling the possession theme with great aplomb. It's a film that has earned a rightful place in the zombie pantheon, especially for those nights in college with some pizzas and a beer. Rewatching this yields the realization that the effects are surprisingly well done and the production is top notch for a low budget picture. Raimi was only twenty-two at the time The Evil Dead was made. It was an astonishing debut with no less than Stephen King calling it, "The most ferociously original horror film of the year." The talented director would film a sequel several years later with Evil Dead II: Dead By Dawn (1987), followed by Army of Darkness in 1992. He has shown his diversity with 1995's The Quick and the Dead, and the excellent A Simple Plan in 1998. In 2002, Raimi hit the big time by helming Spider-Man, the first of three blockbusters for the comic book franchise. Bruce Campbell went on to reprise his role for the sequels and still works regularly. The Evil Dead series made him an enduring cult horror-action star.